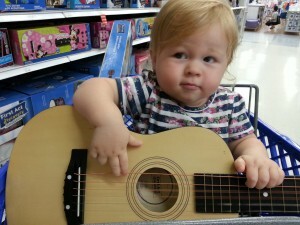 When my son was six years old, we bought him a toy guitar. Then we signed him up for lessons even though he insisted he was already accomplished and there was nothing he needed to learn. His first teacher told us to buy him a real guitar — a small one but a real one — he was not going to learn on a toy. Seems obvious now, but at the time . . . . and the investment began. Every week after his lesson we made him wipe down the instrument and put it away to stay safe in its case. We’d nag him to take it out of its case, practice his chords, then put it away again for the next lesson. After two years of nagging and lessons and keeping the real guitar in its case — no music came out of him. We found him a new teacher. Did two years of lessons “loosen the lid” on his musical ability only to be pulled off by a new teacher? What happened was he was taught to play a song, a simple one. No chords, no scales, no reading notes on paper — just play a song. And it was fun. Oh, and another thing, said his new teacher, leave the guitar out of its case. He should see it, pick it up, hold it on his lap, live with it. Then he’ll play it. Two years ago while on a motorcycle trip through coal country in southern West Virginia, I was struck by an idea for a story. I decided to write a novel. So, I went out and bought a toy — Scrivener. Now, I mean no offense to the developers of this renowned tool for writers. But I was not a writer and for me, this piece of technology was just a toy — it was not going to make me a writer and it didn’t. Then I began to research my subject. I read about the history of West Virginia, the evolution of coal mining in America and West Virginia, in particular. I special ordered books from the Library of Congress to be delivered to my local library on mine disasters and railroads. I took notes, made lists, edited entries on wikipedia. Research does not make me a writer. I’ve always been a reader — of classics, non-fiction, literary and genre fiction. Reading certainly did not make me a writer. What I discovered recently is that I barely know how to read. When I read for pleasure, I burn through a book quickly — for the story, the action, the passion or the surprise. I do not linger on why the story “works” or theme, or character and plot arcs. I don’t think about why I finished a book or tossed it halfway through. I read a mile wide and an inch deep. That kind of reading certainly does not make me a writer. Don’t misunderstand me. I can read and write. You’re reading something I’ve written. I am a lawyer after all and have been for over 25 years. I can research and write a legal brief. But that doesn’t make me a writer of a novel. I started writing stories — little ones. And I’m putting them up here for you to see, warts and all. I’m practicing out loud. My first story is Whispering Encyclopedia. And it was fun to write. Flash Fiction Fridays over at terribleminds.com started me on actually writing. I’m also reading about how to read. How to uncover the depth of a story to understand what the author wanted to say and how my personal experiences make that message deeper. My goal is a finished manuscript with my story in it. So, the investment begins. I have a lifetime of loving to write in front of me. I love the blog. I look forward to reading more! Thanks Jenna, I’m glad you’re going to follow along with me.